Fat Soul Fridays is Now Available on Kindle! 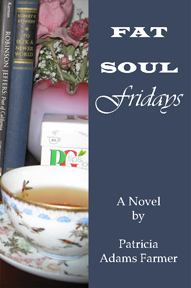 My new novel, Fat Soul Fridays, is now available on Kindle! Fat Soul Fridays is the second novel in the Fat Soul Philosophy Series. Set in 2010, Madeline Prescott (from The Metaphor Maker) returns as a newly retired philosophy professor, adrift with an uncharted future. In an impetuous move, she and her British-American husband, Alex Moore, venture back to the place where they first met to re-open Van Gelder’s Tea and Books with the hopes of recapturing something of their youth. But instead, they find themselves embroiled in the crises of their little group of friends that meets for tea on Friday afternoons to discuss “things that matter.” But all is not tea chat. Humor and poignancy intertwine as their high-strung shop manager, George Saunders, becomes the catalyst for the group’s “happiness experiment,” an adventure which transforms the life of every member of the little group that meets on Fat Soul Fridays. The novel stands on its own, but after finishing it, I hope you will want to read the first one in the series, The Metaphor Maker, where Fat Soul Philosophy is born. Fat Soul Fridays will be in paperback in a couple of months, but don’t wait until then. The Kindle version is economical ($2.99) and ready to download now. Bravo! Theology and philosophy are often best left in the hands of artists and writers. Patricia Adams Farmer’s “Fat Soul Fridays” sings! It’s about beauty and largeness of soul and inspires the reader to look for beauty in commonplace activities and seek a spiritual largeness to embrace the wondrous complexity of life. . . . Click here to read the entire review! Patricia, I am anxiously awaiting the print copy. I prefer turning real pages while sipping my PG Tips! Congratulations on the Kindle version and the excellent review. Exciting times! MORE reason to get that paperback out ASAP–for Sheila Peters and her PG Tips! Patricia, I’m so excited to read ‘Fat Soul Fridays’! I just loved ‘ The Metaphor Maker’! Thank you, Lexy! Your support means the world. Yes, it is a great review. He had a head start with the mss. before publishing. I so appreciate your support, Vickie!